THERE WE WERE, walking down the sidewalk in the middle of the leafy Calle Amsterdam last Tuesday in the trendy Colónia Roma, one of the worst-hit, we had read, areas of Mexico City during September’s killer quake. We did not see any damage whatsoever. Not only that, we didn’t spot any earthquake damage at all during the four days we spent in the nation’s chaotic capital. This condo, one might recall, is where my child bride lived when we met during a visit she made in 2001 to my mountaintop town. The rest, as they say, is history. She worked as a civil engineer for the federal highway department, and the “gated community,” a series of five-story buildings, each with 10 apartments, was constructed specifically for, and sold to, employees of the highway department. We paid off our unit years ago but only received the deed last Spring. Mexican bureaucracy moves at its own laughable pace. Aside from airing out the place and paying the security service, we didn’t do much. Washed sheets and towels from the previous visit and hit a few dining spots, our favorites being Rock N’ Burger, a food truck across the street, and a new restaurant a short taxi ride away that serves the best caldo de gallina on Earth. The caldo de gallina was served at a restaurant named La Jefa. I wrote a review for TripAdvisor, but since the eight-month-old restaurant had never been reviewed, it has not yet appeared on that travel website. We found La Jefa by sheer luck, walking down the street. FYI: Caldo de gallina is chicken soup, but it’s better than your mama’s chicken soup. * It comes with garbanzo beans, rice, and other ingredients, depending on the eatery in question. La Jefa serves a knockout caldo de gallina. I view our Mexico City digs only as an investment for my wife. It’s worth a good bit more now than when she signed the mortgage in 1997. We spotted a For Rent sign on one of the identical apartments, so we called to inquire. They were asking 6,000 pesos monthly, which surprised us, favorably. We may rent it in the future, especially when I cannot walk up the four floors due to decrepitude. That day, however, has yet to arrive. I still bound up like a teenager. The two-bedroom condo is small, so small that it would fit, literally, inside the living room here at the Hacienda. This makes it easy to tidy up. It gives me claustrophobia at times. However, entire families of four or more, plus dogs, live in some of the adjoining, identical units. Incredible. Here’s the living room. We sit here evenings and watch DVD movies and, like back at the Hacienda, dine on salads made by me. I remember well the first time I set hoof in this place back in 2001. She had invited me to visit. The furnishings and wall colors were entirely different, but I recall the visit fondly. I took this photo that first night while she was in the kitchen fixing something for supper. It’s one of my favorite shots, and she hasn’t changed much in the last 16 years. Some women age very well. * Unless your mama’s Mexican. Where did they get the pictures of the rubble that made the news with people digging frantically to rescue people buried in it? I thought at first your “deed” topic said “Dead at Last.” Made me wonder who until I focused again on the words. Carole: Oh, the rubble, damage and deaths are all real. Just because I did not see it doesn’t matter. My experience illustrates, however, that when disasters happen — quakes, floods, etc. — in a city, what you see on the news usually is not the experience of most of the people, and that’s a good thing. And it’s also a good thing that I am not dead at last. I need a bit more time still. Yeah, them news pushers have to sell the news. Disaster sells. I recently was surprised to learn that there’s a whole large section of Colonia Roma Norte to the west and north of the Trend Circuit. (Ave. Álvaro Obregón, Colima, etc.) The northwest section even laps the northern boundary of Colonia Condesa. Maybe that’s where the earthquake damage is. Señor Cuevas: Beats me. As mentioned, we did not see any damage anywhere. Hope you are able to bound up the stairs indefinitely to greet that guapa Chica. Carlos: Hope so too, but I don’t bound up there to greet her because she’s walking behind me with the lighter suitcase. By the way, your comment got sidelined to the moderation file due to a typo in your name. Wasn’t me. And I fixed the typo. Nice apartment, Felipe, and the picture of your wife, muy caliente! I don’t know if we’ll ever get to Mexico City. I’ve heard the pollution is pretty bad, and I don’t want to trigger my asthma again. I do have a Canadian friend who lives there permanantly. He is now fluent in Spanish and does stand-up comedy if you can believe it. After some 500 shows he’s finally been invited on to the Mexican version of Comedy Central. When I can find out when that is I’ll give you the link. I doubt if I would understand the humour given my limited Spanish. Take care. Thanks, Brent. 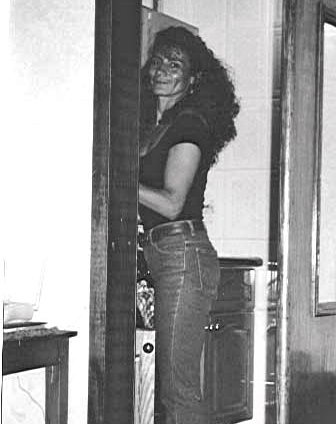 It’s a nice little place with emphasis on “little.” And, yes, my wife was caliente at 41 (in the photo) and remains so today at 57. She really isn’t that much different. She would beg to differ, however. She takes self-criticism to a very high level. Mexico City is a mixed bag. It’s so huge that everything imaginable can be found there. I’ve never found the pollution to be much of a problem, or none at all. It’s said to be worse in the winter, so if you want to visit, come in the summer but bring an umbrella. What bugs me about the place most of all is the horrendous traffic. Just getting from Point A to Point B (we always use taxis which are cheap) is a major and unpleasant undertaking. I wouldn’t live in Mexico City full-time if you paid me. Interesting about a Canadian comic doing stand-up in Spanish. Who’d a-thunk it? The smog is worst in the spring, otherwise it’s OK, and as Felipe notes, summer has the added advantage of daily downpours which clean the air. Mexico City’s reputation for smog is mostly based on the old days before the city worked to clean things up. Yes, it can still be smoggy, but it’s not insanely bad like it was in the ’80s. You can also check the air quality here: http://www.aire.cdmx.gob.mx/default.php, which shows a map and rates contamination between good, regular, bad, and very bad. You can also download the app for a smartphone and check the air on-the-go. Very handy. Kim: Spring, eh? I’ve always heard and read that winter is the worst. Oh, well. You are quite right that smog is nowhere near what it was some decades back. I remember visits in the 1970s and 1980s. It could get really nasty. I never experience similar days there now. I don’t really consider it much of an issue anymore. The measures the city is taking are showing results. Well, it could be winter, but my personal experience is that it’s worst in the spring, April/May, when the city also sees its highest temperatures, which make the smog all the more oppressive. Probably a good time of year to escape to Pátzcuaro. Bounding (not crawling) up four flights of stairs, a palate still capable of appreciating the best version of caldo de gallina, dodging the damage of earthquakes, an ever-increasing portfolio of real estate, you are indeed a fortunate Gringo, señor. And all that before the señora enters the discussion. Ricardo: I would not argue with any of your astute observations. You obviously did not make it to the section of Amsterdam (which by the way is in Condesa, not Roma) which was heavily damaged. One building after another, either collapsed, or heavily damaged (some beyond repair). The apartment building where I used to rent is closed until repairs can be finished. Granted, in a city this huge, most of it went unaffected, but I have seen plenty of damage. William: We must have jumped from Roma Norte to Condesa when we walked across Insurgentes. A map I just looked at a second ago is a little vague about where one ends and the other begins. No matter. I believe you. And I surely would not say the quake did not do serious damage. I know it did. We just did not see any. Sounds like we would have had we continued walking on Amsterdam. I’m glad you’re not buried under rubble. For the life of me, I cannot understand why anyone would voluntarily live in that city. A case of different strokes, I guess. Thanks for the feedback. Always appreciated. I think you and the Mrs. made a wise choice in moving to the Hacienda. It looks awfully cramped in the condo, even in the company of a beautiful woman. Ray: It’s a good place for one person to live. My wife said she was quite content the four-plus years she was there before meeting me. Two people is cramped, and the fact that entire families and their dogs live in identical units never ceases to amaze me, but that’s life down here. They consider themselves fortunate, one imagines. There never was the slightest chance we would have lived there after getting married. The key to successfully living in Mexico City is to live in one of the nicer spots like Roma or Condesa, or someplace close to where you want to be. Then, just walk to wherever you want to go, or take the Metro or Metrobús, though both can get horribly crowded during rush hour. And if you’re not a working stiff with a need to commute (as most readers here aren’t), then it can be an extremely pleasant place to live. By the way, am I the only one who thinks it a bit odd that you didn’t seek out any damaged buildings? Personally, I’m very curious about what happened, what kinds of buildings fell, where, etc. Where most buildings don’t have far to fall. Kim: Roma and Condesa are beautiful parts of the city. Alas, they are also the zones that get whacked worse than other areas when earthquakes come visiting. And yes, those neighborhoods would be great places to live … until your building collapses atop you. Odd that I did not seek out damaged buildings? Why would I do that? I did keep my eyes peeled, however, and I saw nothing. William, who left a comment above and who lives in Condesa, gives me the impression that if we’d continued walking around Calle Amsterdam, we would have seen some of the damage. But a coffee shop sidelined us. I got my priorities.